Leo Da Silva and his Posh team-mates celebrate his goal at Notts County. Photo: David Lowndes. Leo Da Silva Lopes burst onto the Posh scene by scoring a spectacular goal in an FA Youth Cup tie at the age of 15. The opponents at London Road that night were Notts County and young Leo (see player profile) - four days after his 18th birthday - haunted them again in a more prestigious FA competition last weekend (December 4). Posh teenager Leo Da Silva Lopes shoots at goal against Notts County. This time the 25 yard strike in the third minute of an FA Cup tie didn’t lead to a Posh victory, but it’s given the teenager a thirst for more goals to complement his impressive midfield performances. 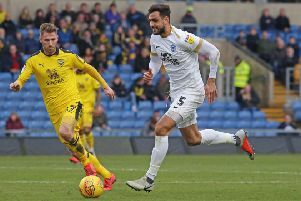 Da Silva Lopes has racked up 32 appearances so far this season, a terrific effort for one so young, even if he is a firm favourite of manager Grant McCann. His other first-team goal was also a stunning effort from distance against Swansea in an English Football League Cup tie earlier this campaign. “I should definitely score more goals,” Da Silva Lopes admitted. “I scored lots in youth team football so it is a part of my game I need to improve now I’m in the first-team squad. I’m sure more goals will come. Posh midfielder Leo Da Silva Lopes in action against Blackpool last season. “The season has gone well for me so far. I’ve started many more matches than I expected I would. “I started pre-season well though and that gave me the confidence to feel I belonged with the first team. “It was disappointing not to hold on and beat Notts County, but we’ve got to forget that and make sure we beat Chesterfield now. With attention comes transfer speculation for young players, but Da Silva Lopes is very single-minded about his career. And manager McCann knows Posh have unearthed another gem. “Leo is going to be a top, top player for this club,” McCann insisted. “He’s still striving for the consistency all young players struggle to find, but he has been outstanding for us.